Since ancient times, figs have been one of the cutest summer fruits. Easy to pick, easy to peel and best eaten fresh under the tree. Not so easy, however, to find the cultivar name of your favourite fig. Identifying figs is tricky and confusing. Koos Lötter’s book The Fig in South Africa, published in 2014 with descriptions of the most common fig tree varieties, is a good guide. Koos Lötter and Dr Gawie Rossouw also helped us select old fig varieties to plant on the farm and edited the names of the figs in our historical garden. 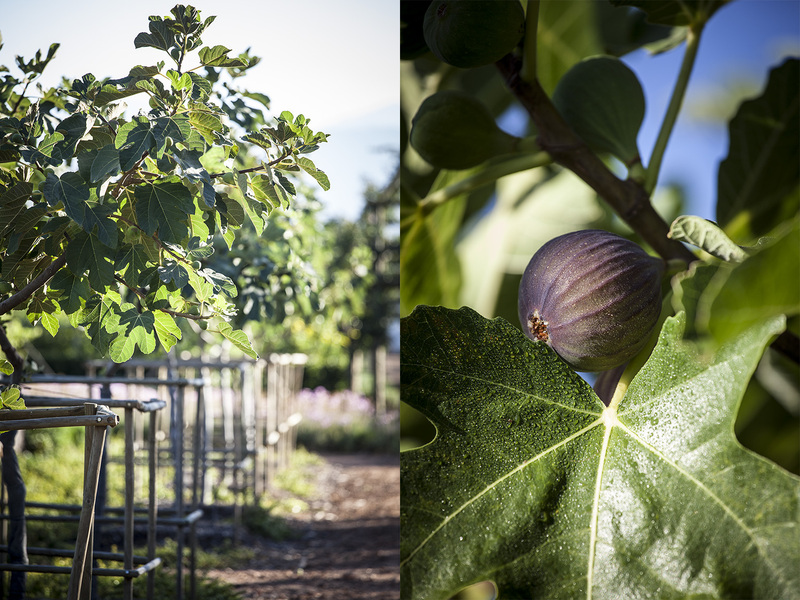 Come and visit while the figs are ripe and see ten different cultivars in our growing collection. Black Mission was the first fig cultivar taken from Spain to America, where it was planted around mission stations in California. Easy and reliable with a typical fig taste, this is a classic pear-shaped fruit with purple to black skin and red flesh. 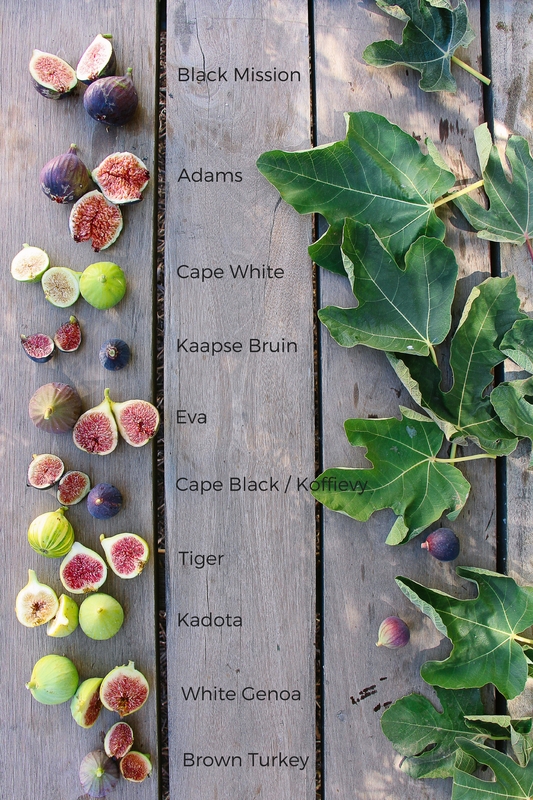 Adams is one of the oldest fig cultivars in South Africa. Huge leaves (to hide Adam’s pride, see), large fruits, with purple skin and dark red flesh when ripe, ripen late in the season. Cape White or Kaapse Wit is a very sweet French fig. The small flat fruits with green-yellow skin and straw-coloured flesh ripen early. Kaapse Bruin is one of South Africa’s oldest figs, common since the early 1900s. It ripens early to mid-season with a uniformly brown skin and pink flesh. Resists the attentions of flies well. Eva is a unique South African cultivar with small, egg-shaped fruits, greenish purple skin colour and straw-coloured flesh. Cape Black or Koffievy is another unique South African cultivar popular in domestic gardens. It is a small, black early fig with straw-coloured flesh. Can be eaten with the peel. Tiger or Tiervy is a striking yellow and green stripy fig, fun to grow in the garden and beautifully espaliered at Babylonstoren. The flesh is reddish pink. Kadota is an old Italian cultivar with a prominent, fleshy stalk and typical drop of sugar in the “ostiole” or bottom opening when ripe. The skin is greenish yellow with white flecks and the flesh yellow-pink. Worldwide this is a popular fig for jam, green fig preserve and for drying. White Genoa was for many years the most popular for supplying breba figs or voorvye for green fig preserve. 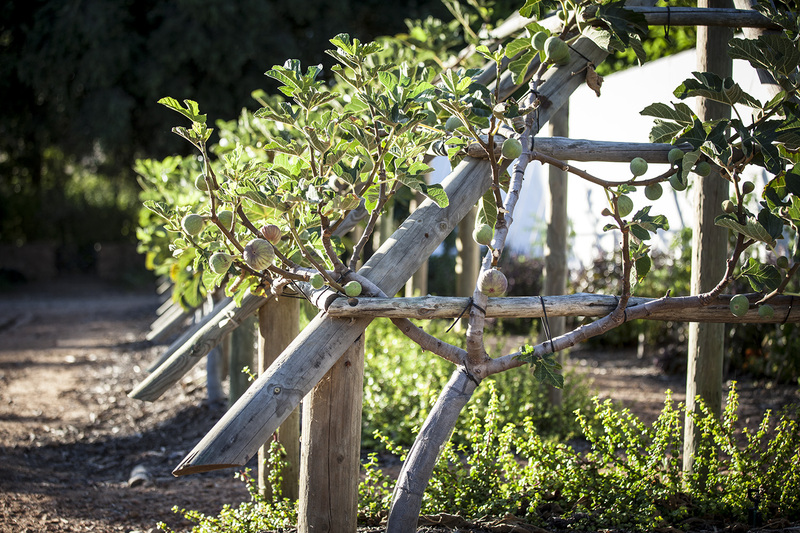 At Babylonstoren, this is an early fig that ripens end of January to early February, with an abundance of large, sweet fruits. Skin is yellow-green and the flesh pink. 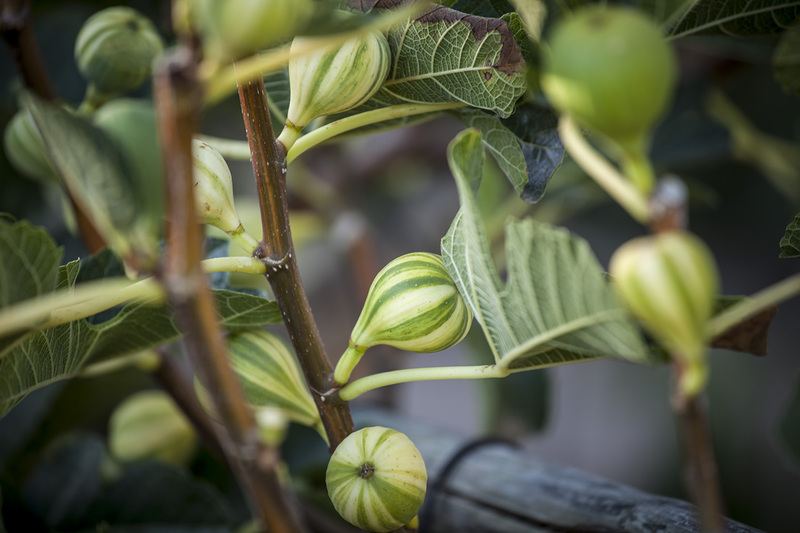 Brown Turkey figs ripen late in the season with light brown to red skin and dark red flesh. Peel and enjoy, but don’t get chucked out of Paradise! Can one purchase fig trees from the farm? The nursery on the farm is for our own use, when we have extra we will sell some in the farm shop, but very rarely. We are happy to give cuttings to visitors, so do ask one of our gardeners when you visit us. Gardener Liesl van der Walt answers: We get our best early harvest from the White Genoa which is a strong grower, easy to espalier. The attractive stripy Tiervy/tiger fig is good for mid-season, while Adam is known to be late in the season. The small black koffievy or Cape Black is wonderful to eat skin and all, with figs to pick for a good month or two. I am very very interested in the cape white fig. Do you also sell trees? Very interesting reading. Our fig trees were killed by worm under the bark. It had to be hooked out, but tree still died. Hope to grow another fig. I like the idea of the White Genoa for preserve. We have an Adams fig. Am I right that you find two different shaped leaves on the same tree? I love figs. Grew up with fig trees in our garden in Upington. 1950’s. They were huge figs both dark and whites. What type of soil do they prefer? Alkaline? I grew them successfully in Namibia too but not here in Cape Town. also had no success in Port Elizabeth. Gardener Liesl van der Walt answers: A pH range between 6 – 7.8 is optimal, very high or low pH will cause nutrient deficiencies. Prepare a good planting hole by loosening up to 1,5 m to ensure good drainage and supply plenty organic material, phosphate and potash to encourage a deep root system. Figs are also beautiful in pots and respond well to pruning as the fruit is grown on new growth. And remember – full sun is best! I have a few plants i cultivated from old fig trees on our farm. 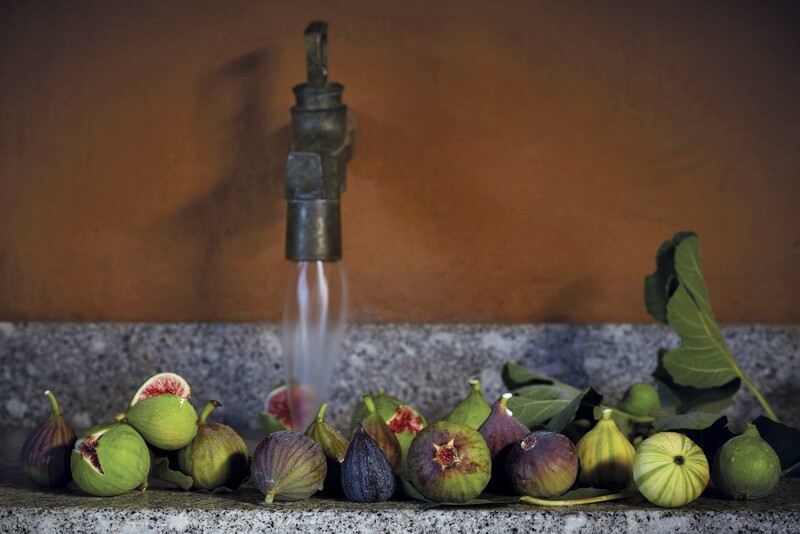 It is very tasy fig…..the best i ever tasted and loved all the years on the farm. We called it Smirna figs. They almost look like the fig you call Eva. Do you know the name or the fig? Dear Stefan, we don’t know the name. But if you send a photo of the skin and the inside of the fig to liesl@babylonstoren we can ask Fig expert, Koos Lotter, to assist. He helped us identify our figs. The word ‘ Smyrna’ in the fig world relates to a class of figs requiring poliination or caprification to set fruit.. and these fruit, IMHO , are world class figs, the very best. You would be a very lucky man if within your farm, do have the capacity to pollinate figs. Thank you for this informative post, I only knew about the Genoa and Adams figs. You are quite right, eating figs as you pick them, standing under the tree is the best memory of my teen years! Hi Nerina, very dark fig with red inside is most probably Black Mission! Hello, we won’t b able to send it to Malaysia.